Hi Good Morning friends, Thanks to all my friends and viewers. 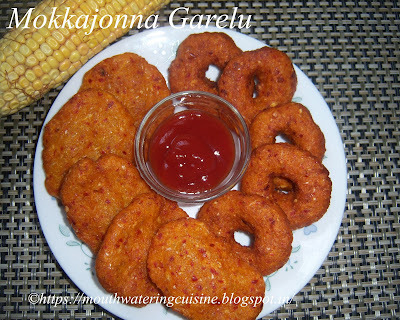 Today I will write how to make mokkajonna garelu or corn vada. These are made with maize corn cob. This is the season we get them here in India. They are sold in every local market. We get tender cobs to pressure cook them, add them in sambar or sprinkle some red chilli powder and salt on them and enjoy. We can prepare different varieties of dishes with maize corn like dosa, vada, poori and pakodi. Vendors grill them on charcoal and apply little salt, red chilli powder and drizzle some lemon juice on it and serve. They are very tasty and have to be consumed immediately. I buy a dozen of them and make almost all the varieties of them. And I grill them on stove top also. Making all of them is very interesting but preparing is a task. We have to deseed them from the cob. It is a time taking process, we do not get the deseeded one like sweet corn. We have to take some time and do it. It is a family job, kids also love to participate in that. OK, Now is the time to talk about the recipe. These vadas are made differently by different people, some add chopped onion, green chillies and coriander leaves to the batter. Some grind all of them together and make vadas. Some do not add any flour and some add rice flour and besan to the batter. It all depends on the taste and their habits. But the main ingredient should be maize corn. This recipe I got it from my friend Geetha. This recipe is followed by most of the Telangana people, a state in India. They call it as Makka Vada or Makkai ki Vada. Here in the recipe table, I gave corn measurement in cups only. I took approximately three cobs of corn. I deseeded all the five corn cobs and kept in the refrigerator, took only 2 and 1/2 cups of corn out of them. I still have some left in the box. So this number is only approx figure no the actual figure, please use them accordingly. Deseed the maize corn from the cob. We can do this before hand and keep them in an airtight container. In a blender jar combine all the ingredients except rice flour and oil. Grind them to a coarse paste. Do not add water, it is not required. Take the grounded batter in a bowl and add rice flour. Make thick batter, to check the consistency of the batter, take small portion and make small roundel out of it. It should form easily and should not stick to our hand. Then it is in right consistency. Heat oil in a thick bottomed kadai, check heat of oil by dropping small portion of the batter. If it comes up immediately and float on oil, then the heat of oil is right. Simmer the flame, take small portion of the batter and press it gently on the palm or on finger directly. Drop it slowly and carefully in the hot oil, repeat the same with some more batter. Drop as many as can be fried once. Do not over crowd. I made it in two ways, one with a hole in the middle and the other without hole. It can be made either way, that is out choice. For making hole in the middle, press it on an oil paper or on our palm and make a small hole with the index finger. Fry them in the low flame till they turn golden brown colour. Take them onto a kitchen paper, repeat the same with the rest of the batter. For more evening snacks click here.Thank you for visiting my blog. Hope you liked all my recipes. Any feedback and comments are appreciated. I love to eat this Corn Garelu Recipe. It was very tasty and so Crispy thanks for the sharing Recipe. Corn Medu vada(Mokkajonna Garelu) is a Crispy evening snack. It was so delicious and very tasty and I want to make again. Thank you for the recipe sharing.